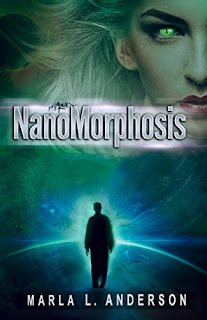 NanoMorphosis takes the reader to a futuristic world where everyone knows that the time for sustainable life on Earth is coming to an end. It is seen in every aspect of normal life as people try to go through their daily tasks. Natural resources are disappearing and there is a terrible disease spreading through the country that causes human skin to decay, giving the disease carriers the look of a toad. 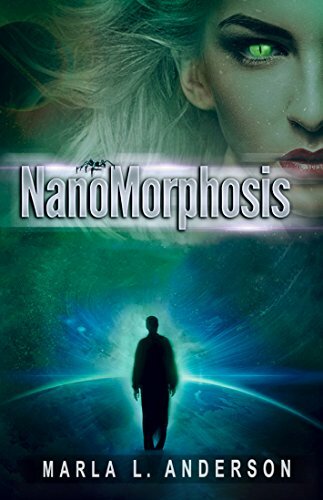 Both Daniel Walker and Cadmon Dhyre are acutely aware of these problems, but have two completely different solutions they believe would save mankind. On one hand, Daniel Walker believes the only hope for the human race is to find another planet similar to Earth in deep space. His belief in this idea runs deep, for his parents and their crew were killed by an alien race called the Garuda, while attempting to find a new planet. Just a boy at the time, Daniel was a witness to his family’s gruesome deaths, and only survived after finding safety in a small pod until a rescue ship was sent for him. The nightmares of that day still haunt him and fuel his determination to complete his parents mission - whatever the cost. At the beginning of this book I felt as if it was going to fall into the typical story of alien life on another planet. However, I was pleasantly surprised that the story quickly emerged into a tale with a unique storyline that I found quite exciting. The characters were fully developed and the author also introduced us to their past, which highlighted the reason for their beliefs as adults. This then added an intriguing psychiatric element to a science fiction thriller. NanoMorphosis reaches into the imagination and brings to life things I had not fathomed yet, which made it so much fun to read. Quill says: A story of alien life with an exciting, unexpected twist. For those who are unaware, a mighty realm exists called Crystonia, with a throne that has been vacant for some time. A young Duende (a descendant of the fairies), by the name of Carling, was first told by the mighty Wizard of Crystonia, Vidente, that she was the one…the future ruler of it all. At their first meeting Vidente brought forward the royal Silver Breastplate—an artifact that the chosen one would wear once they proved themselves by finding gemstones across the kingdom that set into the Breastplate. Once all the gems were found, Carling would be hailed as Queen. However, there is pure evil waiting to stop her. Zarius is the Commander of a rebel faction of Centaurs whose only mission is to capture the throne. Carling has met Zarius before. This ego-driven Centaur has actually been bested in battle by the young Duende, which caused a wound to both his pride and his body. Carling has returned from finding the Stone of Courage (after also discovering the Stone of Mercy in Book 1). She is summoned to the home of the historian of the mighty Centaurs, so that he may give her an old map of Crystonia which he tells her to keep safe. Teaming up with her best friends, another Duende named Higson and their two Centaur friends, Tibbals and Tandum, Carling heads home to rest before the next step has to be taken. Quickly discovering that Zarius and his crew are on their tails, they barely make it through the gates. 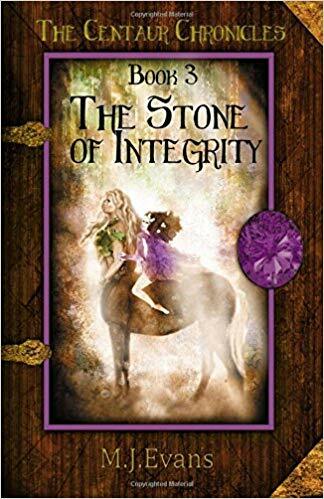 It is there that Vidente returns in a swirl of dust to let Carling know she must now head to an island where she will find the Stone of Integrity. The quest commences and characters come out of the blue; from an old fisherman named Fyzzle who will help Carling and her friends find this island that many do not believe even exists; to a witch named Hilgalda; to a young, handsome character by the name of Kelfy. Readers are taken on another brilliant ride filled with dazzling locations and a plot that continues to thrill, as Carling must not only locate the stone but also figure out who, exactly, are the liars in her midst. The Swirling Sea. The Forest of Rumors. The cool scenery abounds in this series. Author M.J. Evans continues to put together a series that entices all readers. In fact, you secretly find yourself hoping that when all the stones have been collected, there will somehow be a second side to the Breastplate with even more “holes” to fill in. That way, this incredible journey will never have to end. Quill says: Another perfect addition to The Centaur Chronicles that entertains from beginning to end. 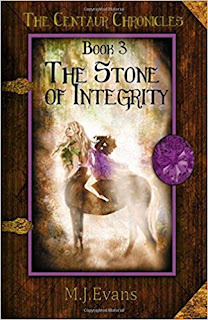 For more information on The Stone of Integrity, please visit the publisher's website at: www.dancinghorsepress.com. Hannah has quite an appetite and in Hannah's Tall Order her taste buds are about to get the better of her - and have readers in stitches too. How do you make a sandwich using every letter of the alphabet? And more importantly, perhaps, how do you eat that sandwich? Hannah is about to find out as she strolls into Mr. McDougal's cafe and orders her idea of a perfect meal. "Avocados and bean sprouts - fresh carrots galore. Dill pickles, egg salad - those figs I adore!" McDougal got busy and started to chop. He peeled and he minced. He grated nonstop! 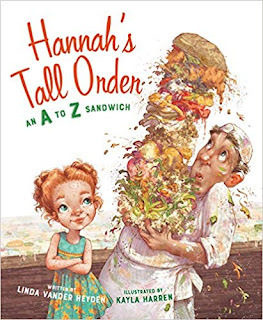 Kudos to author Linda Vander Heyden who somehow was able to take ingredients from each letter of the alphabet and fold them seamlessly into a sandwich poem that flowed perfectly. Red-headed and very freckled Hannah is adorable and the expressions on Mr. McDougal's face as Hannah picks out ingredients are priceless. In other words, the illustrations are a perfect match for the very funny story. With the abundance of alphabet books to choose from, this one is truly unique and should be at the top of the list to add to your collection. Quill says: I LOVED this book! With a perfect rhyme, and lots of fun too, it's just what the deli owner ordered to help kids learn their ABCs! 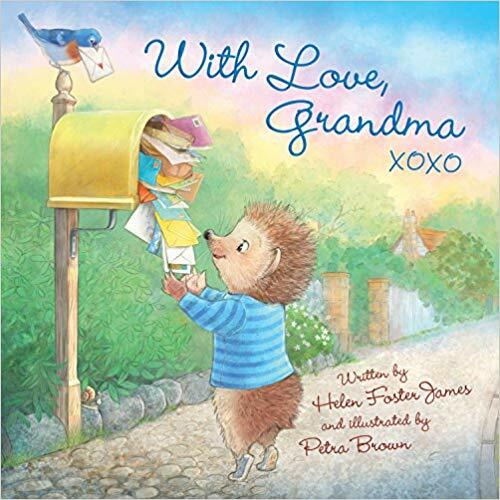 There's nothing like the special love a grandmother has for her grandchildren, and in With Love, Grandma, author Helen Foster James brings that love to the page through the use of an adorable pair of hedgehogs. With Love, Grandma begins with Grandmother Hedgehog in her car, with a cute little camper attached to the back, waving good-bye to her grandchild who has come outside to wish his/her (we never learn if the grandchild is a boy or girl - which allows parents reading the book to their children to decide) grandmother a fun trip. Then off Grandmother goes on a mighty adventure. I've always loved letters and hope you will too. I'm writing this letter in a meadow full of flowers. She then goes on to suggest that "April Showers" brought a lot of May flowers and so she's sending her little "Sweet Pea" a packet of wildflower seeds. Every letter that the grandmother writes addresses the grandchild with a different pet name - Sunshine, Little June Bug, etc. and they all end the same - With Love, Grandma XOXO. In between are brief letters about camping, taking a painting class and even kayaking. Grandmother is definitely having a busy and fun time! She also makes numerous references to "Camp Grandma" where she says her little one will have lots of fun when she returns home. With Love, Grandma is another book where author Helen Foster James and illustrator Petra Brown have paired up. They previously worked together on the best-selling "Loves You" series and their success with those books definitely comes through in this one. The hedgehog centered illustrations are quite lovely and the story, which shows just how strong the love of a grandparent for a grandchild is, no matter the distance, is one that will give children a warm, cozy feeling - and that's a perfect feeling as one falls asleep at night! Quill says: How can you not enjoy a book about a grandmother's love for her grandchild? With sweet letters and adorable drawings, this book will charm all those little sweet peas who look forward to visits from their grandparents. Young girls today are under tremendous pressure and things like what to wear, what to eat, what group or sport to join, are just a few of the decisions that add stress to their lives every day. 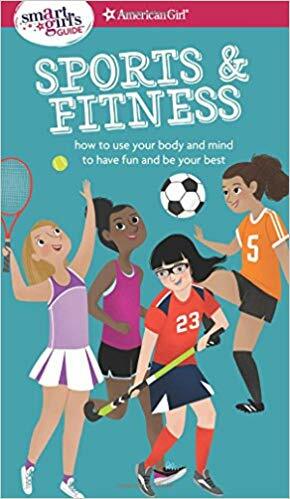 With Sports & Fitness, a new addition to the "Smart Girl's Guide" series published by American Girl, youngsters gain an excellent resource to help them make the right choices. This book speaks directly to young girls and aims to show them "...how to be the best athlete you can be, in both body and mind." As adults know, but young girls may not yet realize, to be good at sports, you must take care of your body. Thus, Sports & Fitness focuses many of its pages on taking care of one's body. Six chapters divide the book into very readable sections - play power (discusses various benefits of sports participation), your body, power drills, your mind, brainpower skills and you & the team (team or solo sports, dealing with coaches, how to be a leader). The text is accompanied by an abundance of colorful illustrations, making this a very easy book to read. It also invites a reader to jump around to various topics to get the most benefit from the book. Important topics such as staying hydrated, how to warm up properly as well as dealing with bad behavior are covered, some lighthearted ideas are included (crafts to show school spirit), in addition to many more things that are needed to enjoy success both during sports participation as well as life in general. 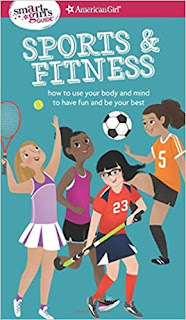 Without getting preachy, Sports & Fitness covers an array of topics that will help girls have the best experience possible in the world of sports. Quill says: An excellent book for girls to help guide them through decisions related to not just sports but to all aspects of their lives. Wouldn't this award seal look great on your book? Nominations are now open for our annual award program. Now through August 31, we're offering an "Early Bird" discounted nomination fee. Hurry, expires in just a few days! Those of us who have reached "a certain age" all know the signs - our bones creak, it's hard to get out of bed in the morning, and we find ourselves wishing to be young again. However, since we all know that we can't turn back the clock, author Judy Sheer Watters advises that if we adopt a positive attitude, people will be drawn to us and we all will benefit as we transition to old age. In this journal, the author begins with an introduction that describes a show that she and her husband enjoy. This show, about digging for gold in Alaska, she argues, is much like life. In the show, people hope to get rich by finding a lot of gold, but that's rarely what happens. In life, too, we start out with high hopes, but with the unexpected "bumps" that every person encounters, we find ourselves, at the tail-end of our lives, typically in a very different place than what we originally imagined. How we handle that transition to old age will profoundly affect how we deal with, and enjoy, our later years. Watters main premise throughout the book is that "...by aging with a positive outlook, we can be outward focused, not inward focused. When we are outward focused, people are drawn to us. This gives us the opportunity to be a light in their lives. Being a light in the lives of others, causes us to have a joyful outlook. It's a win-win for all." Simple, right? But how do we stay positive when our bodies hurt, our family moves away, and other aspects of aging make it difficult to stay happy? Watters uses stories of her mother to show the reader that there are ways to keep a positive spin on all aspects of our lives, regardless of how we may initially think of those events. Meet Judy Sheer Watters' mother - a spunky, funny woman who, at the time the author wrote the book, was a spry ninety-six. In fourteen short chapters, we follow along with Watters as she recounts events in her mother's life, events primarily from her later years. These events, most of which we have, or will, experience ourselves, are things that Watters' mother faced with a positive attitude. Things such as an "empty nest," memory loss, and giving up the home where she raised her family, are all events chronicled in the book. But rather than mourn the loss of these things, Watters' mother would see the positives and thus was better able to manage the changes that occurred. The empty nest allowed her to downsize and enjoy living with a family member, the fear of moving into a nursing home was turned into enjoying new friendships with the other residents, and giving up her driver's license removed the stress and fear of driving in traffic. By always seeing the plus side of the equation, Watters' mother made it easier for herself as well as those around her. I wasn't sure what to expect when I first opened Panning for Gold in Our Golden Years - I didn't want to read another depressing book about aging. But within a few pages, I was smiling, and soon laughing, at the antics of Watters' mother. Included are several conversations that will definitely have you giggling and wishing to meet Watters' mother. Even better, the advice given through the author's experiences with her mother are ones that can easily be incorporated into our daily lives. Every chapter begins with a quote from an author, politician, actor, etc., that is relevant to the chapter, followed by the story from her mother, another quote, then "Your Time for Reflection" with notes about what to think about along with a few lined pages so you can write directly into this journal. 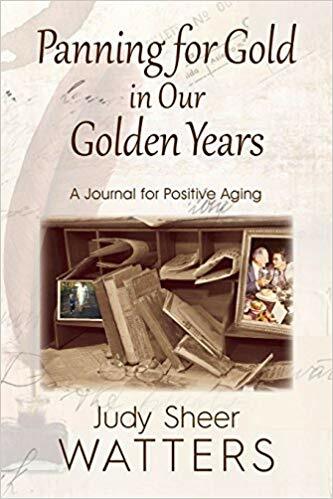 I didn't expect to smile and laugh while reading a book on aging, but with the positive changes that author Judy Sheer Watters espouses, you too will find yourself enjoying this book and thinking of how you can change your life for the better. 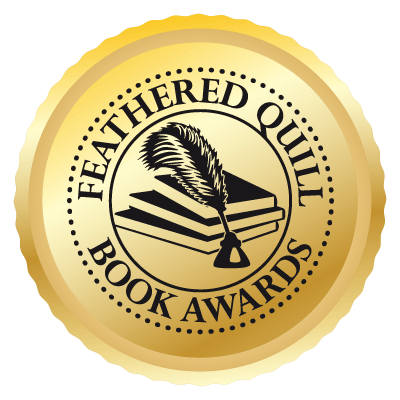 Quill says: A quick reading book that is also a very uplifting book. Author Judy Sheer Watters, with her lessons on aging, will have you almost looking forward to your golden years. 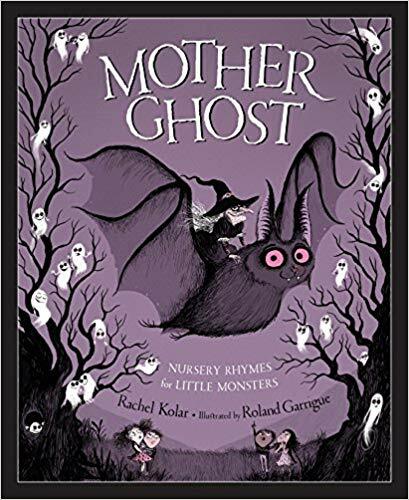 Get the candy corn ready for all the little ghouls who are headed your way, and while you're at it, grab a copy of Mother Ghost to help get your little monsters in the mood for a heck of a lot of fun! For those who love Halloween (and how can you not love Halloween??? 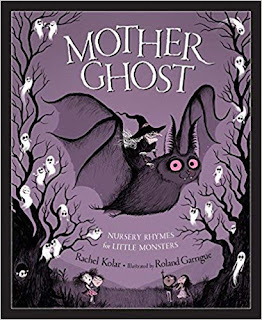 ), author Rachel Kolar's new book, Mother Ghost, is a wonderful addition to the bookshelf. In this book, children will be delighted with the new spin she has put on several well-known nursery rhymes. Not just clever, these re-imagined rhymes are downright funny. Did you know that "Mary Had a Little Ghost" and can you guess "What Are Little Bats Made of?" Your little ones will delight in learning just what "Wee Willie Werewolf" does when he "runs down the street." We all know "Mary, Mary, Quite Contrary," but what about "Mary, Mary, Tall and Scary"? A big part of what makes this book so much fun are the great illustrations. Roland Garrigue is a prolific illustrator of children's books who, according to his website, loves drawing monsters, vampires and witches, and it definitely shows up in his work. A bit surreal, the characters are goofy, non-threatening, and funny. Combine that with the clever rhymes and you have a definite winner. Enjoy! Quill says: Your "little monsters" will love this new, spooky twist on their favorite nursery rhymes. Beautiful birds, intriguing insects, and all sorts of interesting plants - all enjoying your backyard habitat. Wouldn't that be wonderful? 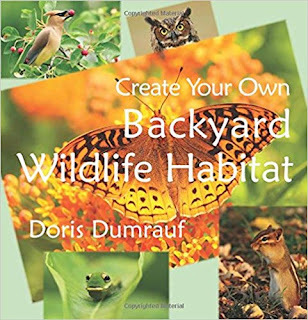 In author Doris Dumrauf's new book, Create Your Own Backyard Wildlife Habitat, she introduces young readers to many amazing creatures and gives ideas on how to create the perfect environment to attract them to your home. Create Your Own Backyard Wildlife Habitat opens with a page describing some basic things that wildlife and plants need to survive. Nectar for insects, water for birds, and what is hiding just below the water's surface? Accompanying the text is a vibrant photograph of a backyard habitat with a small pond complete with water lilies. The bulk of this lovely book is devoted to showcasing various birds and insects that might be found in a backyard setting. First up is a very happy looking cedar waxwing with a bright red berry in his mouth. We learn that the bird makes a "zit-zit" whistle to announce his arrival. Compare to the Eastern bluebird - on the opposing page - who works hard all day catching crickets and other insects for his chicks. There is a great selection of different birds and insects, including moths, caterpillars and butterflies within the pages of this book. On one page we meet both the hummingbird clearwing moth and his once caterpillar self, with a close-up picture of both and text describing how it drinks nectar and what type of flowers both forms enjoy. Want to know what a chipmunk or squirrel need to survive? How about an American hover fly? These animals and numerous others grace the pages of this book. Each page features one creature, with one or two photographs, along with text briefly pointing out an interesting fact or two about that creature. Within the text are snippets the author has cleverly inserted that will help readers understand and prepare a habitat that will encourage that featured bird, moth, squirrel, etc., to come visit. Additionally, there is a two-page spread at the back of the book with "things to remember when you start your own habitat." No review of this book would be complete without mention of the great photographs. Yes, I mentioned them above, but really, they deserve more as they are really fantastic. Close up views of so many creatures, down to the drops of water flying around a robin as she enjoys a bath and the "eyes" on the back of a spicebush swallowtail caterpillar. They really add a lot to this book and will undoubtedly entice many youngsters to explore its contents. Quill says: A wonderful, instructional and enjoyable book for young readers. KAYA: Being born in a small village and having the opportunity to travel extensively gives me stockpile of experiences. But story telling is a talent that either a person has or does not have. I believe strongly that writing is something that cannot be taught. All you can do is to put your story out there and see if you get a response. I was a loner in my childhood and did not have many friends. To compensate I would make up imaginary friends and imaginary situations that I used to create in my mind. I believe this early experience helped me develop a creative side. I left the comfort of my home and family to get a good education and take care of myself. If I had stayed in my village I would have ended up looking after my siblings. That is what my father wanted me to do, but I refused and chose another path. FQ: Is there a place you have not yet visited (perhaps an archaeological site) that you would love to see and have it play a part in a future story? KAYA: After I graduated from California State University Channel Islands in 2017, we made the momentous decision to move to our cottage in Florida. My mother-in-law was a writer and the cottage was filled with her books, treasures, and wonderful memories. In such inviting surroundings, I felt the need to start writing again and finished the novel in nine months. The locations are all local to us, but I did change the names. For example, in the first chapter, Jack is having dinner at Bayside Restaurant which is, in actuality, our favorite restaurant, East River Smoke House. On our first dinner there after moving, we were sitting out on the deck and I was mesmerized by the picturesque view across the bay. Returning home after dinner, I sat down and completed the first chapter. I was also reading a book about todays private military companies. And so the novel was born. Jacques Ludefance is actually a minor character in Murder on the Naval Base. It just seemed natural to develop him into a major character for this current novel. But, he is entirely fictional from start to finish. After completing the first chapter, I began thinking about how the story might progress, beginning, middle and end, and then started doing more research. Jacques Ludefance is an interesting character. From New Orleans, he moved to a small beach town located in the Panhandle of Northwest Florida. A scar over his eye, he lives aboard his boat, The Luna Sea, with an alligator named Emma, which brings about the nickname he is called by many: “Alligator Man.” Now, although this may sound like a pirate out of his century, Jacques is actually a retired Navy man who works as a P.I., and he’s about to get a case dropped on him…so to speak. Sitting at his favorite restaurant, a lovely Asian woman walks towards him and begins to speak. Unfortunately, before all words could be said, she slips from a barstool and drops down on the floor – dead. What the Asian woman does get to do before going to meet her maker is hand a brown envelope to the P.I. who stashes it quickly, knowing that the police will be looking all over for clues of any kind. Calling the sheriff to let him know about the corpse, Deputy Erik Lawson appears on site. Lawson is an old pal of Jacques because they served together for a good number of years. When all is said and done, and quite quickly by the way, the woman is found to be dead by natural causes. A bleeding ulcer was her demon, and the case is closed. Of course, Jacques isn’t done yet. He believes that he “owes” the woman a bit, once reading over the information he received from her. Not only was he given a variety of documents, but he also received a picture of a woman with her throat slashed and stacks of $100 bills totaling twenty grand. It turns out this lady once had a very real name and a home in Vietnam, until she was “lucky” enough to marry one of the wealthiest businessmen in the area: Jonathan Holler. She ended up being called Lillian Holler, wife of the man who runs the import-export business, Holler Enterprises. Even Deputy Lawson is suspicious of this man. After all, he employees hundreds of people in the area, it has been reported that he’s exported various used machinery from the U.S., but there are a great many questions as to what he has been importing from Asia. These rumors run amok, and it doesn’t take long to wonder if Lillian, the wife, was one of his many “imports” when it came to human trafficking. Jacques goes on the proverbial hunt; a hunt that will take him from California to Dallas and back again. A hunt that will have him placing a “spy” inside the walls of Holler Enterprises in order to see if information can be gained. And a hunt that will lead both of these people into severe danger. Get ready for FBI, ATF, bombs, saving an alligator – you name it, this one has it. This is a story filled with action and suspense. In addition, with the background this author has and the travels he’s taken, the descriptions are extremely detailed. You feel like you’re literally standing in these locations as the complex, entertaining mystery comes to life. Quill says: Pulse pounding! This is not only a memorable story, but you will not want to wait long before crossing paths with this P.I. again. Mitchell’s Inn in the mountains of New York is a luxury hotel. On a Friday night, with a snowstorm coming in, it is turning out to be a great place for a relaxing getaway - for a lot of people. Gwen and Riley are two friends who attended the same journalism school. After graduating, the two went into completely separate careers. Gwen became a communications person for a corporation while Riley decided to be a journalist in war zones. Since Riley’s work has drastically changed her, Gwen is hoping this weekend will help get Riley back to her old self. 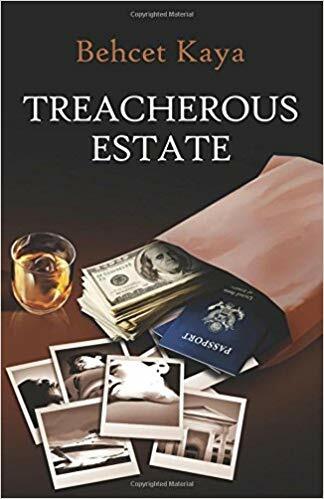 David, a well-known defense attorney, is hoping to get away from his crazy life. This weekend away, being cut off from all communication, will hopefully give him some much needed alone time to deal with his hectic life. Beverly, who is at the inn with her husband Henry, has a more romantic idea for this weekend. Between their children and full-time jobs, they haven’t been able to have any "alone time." Beverly hopes that this weekend will be just what they need to get their marriage back on track. Dana and Matthew are the engaged couple. With their wedding coming up, the planning has taken a toll on Dana. Matthew hopes the weekend will refresh them so they can make it through the last stage of the planning. Candice White, the one who mostly keeps to herself, is the writer. With a book that needs to be finished, Candice has decided to take the weekend off from caring for her mother, and come to the inn to get some needed quiet time to finish her book. Finally, there is Lauren and Ian, the new couple. Ian, looking to spice up the new relationship plans a nice romantic weekend getaway. As the guests begin arriving, the winter storm starts to take a turn for the worst. With only two staff members, James and his son Bradley, guest services may suffer just a bit. During the night, the storm turns into an ice storm, and the hotel loses power. Not only does the hotel lose power, but with the roads still covered, they are all completely shut in until the roads get clear and power gets restored. When Lauren wakes up on Saturday morning and feels how cold it is, she realizes they must have lost power. Wondering if anyone else is up, she heads downstairs. As she is walking down the steps, she notices Dana laying at the bottom. As she checks to see if Dana is still alive, her surprised scream alerts everyone and they come running to see what happened. Most people guess that she must have fallen down the stairs, but David isn’t convinced. He suspects murder. Without power, there is no way to contact the police. David instructs everyone to leave Dana there and advises Matthew to stay in his room until they can contact the police. With a sheet covering Dana, everyone tries to get on with their Saturday. An Unwanted Guest was an amazing book that was truly hard to put down. It was very detailed and made me feel as if I was right there with the guests at the inn. The book is set up to test the reader's detective skills. You do not know the "why" until the very end, but you have your list of suspects and their alibis to help you figure out who the murderer is. But will you? The plot kept me guessing and will definitely keep you guessing too. Quill says: If you want a great who-done-it story that will test your detective skills, this is the one for you! What happens when girl meets boy and the chemistry is spot on; yet the universe steps in and throws a devastating curve ball to the budding romance? 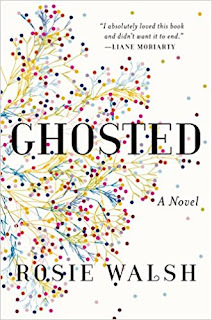 Rosie Walsh takes on such a premise and treats her audience to an intriguing tale in her debut novel, Ghosted. Sarah Mackey is back in England. It’s the anniversary of the life-changing and tragic occurrence from nineteen years earlier. It was a blistery, hot day in the English countryside. Sarah began to wander down that familiar path toward the village. Children played in the yard of the primary school and their innocent sounds were interrupted by the bleating sheep who’d lost its way. What caught her attention was the response from a male—a strong and certain ‘…BAAA, it shouted. BAAA!’ followed by laughter. It was the laughter of Eddie David that captured Sarah’s interest. He was sitting with his back to Sarah and by the time she reached the green, it appeared man and beast were having a proper conversation with each other. She approached the stranger and gambled a simple ‘hello.’ After learning the sheep had performed a near-perfect escape from its rightful pasture, Eddie informed Sarah he knew from whence the sheep had come. It would be nearly an hour before his rightful owner would come to collect him. In all truth, Sarah had no plans of wandering down the hill let alone join this stranger for lunch at the pub. Yet, there was something in the way he smiled—his laugh; so charismatic. For the next six days, the two became inseparable. They were cocooned together with a solid connection and there was no coincidence that they were meant to be together forever. However, on the seventh day they would part ways due to a previous holiday Eddie had planned long before he met Sarah. Perhaps coincidence wasn’t the cupid that had connected the two. In the days following their separation, Eddie vanishes. Sarah cannot let it go and her friends are insistent she do just that. Was it as simple as Sarah being Ghosted or was there something deeper Sarah needed to explore before she could let go? Rosie Walsh pens a novel that is far from predictable in the notion of girl meets boy and they live happily ever after. She continues to fold and build a plot with a multitude of twists and turns that entices her audience to continue to turn the pages. This is not a simple tale of a woman being dumped by a man who she thought was ‘the one.’ Rather, there is a solid plot of wonder and intrigue that builds on a premise of uncovering a painful truth and the challenge of the truth either setting one free or laying a foundation of what can be once the truth is uncovered. Walsh has a gift toward laying beautiful prose and narrative and complements both with descriptive scenery and credible dialogue. She nails the concept of being ‘dumped’ perfectly. 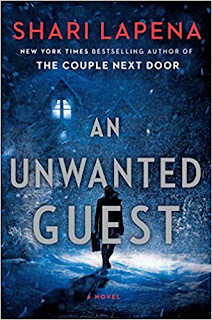 Yet, she consistently goads the reader on with a sublime notion of: ‘maybe this isn’t how this love story is supposed to end after all.’ This was a captivating read and I applaud Ms. Walsh for her ability to hook her audience on the very first page and refuse to let them go until she decides it’s time to do so. Well done Ms. Walsh! I am a fan and look forward to your next book. 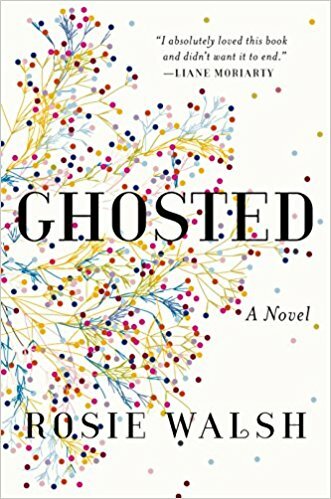 Quill says: Ghosted is a testament to seeking the truth no matter how painful the journey may be. Bully is a big green bullfrog who lives in a lily pond. In fact, there are lilies everywhere in this pond and Bully just loves splashing around in the water and enjoying the lilies. But so do many other creatures. Unfortunately, Bully doesn't like to share. Bully loves spending his days eating the lilies in the pond, enjoying their wonderful smell, and sitting on them! One day, while Bully is enjoying "his" lilies, a happy little snail comes along and starts eating one of the lilies. Bully was NOT happy because "...he wanted the lilies all to himself." Bully made it very clear that he wasn't about to share the lilies and he demanded that the snail leave the pond. Sadly, the snail left. Next a dragonfly flew to the pond to enjoy the fine smelling lilies. Bully would have none of that as he shouted, "Hey, you! Get out of my pond!" In fact, every animal that came to the pond was quickly told to leave by Bully. Once everybody left the pond, Bully was able to enjoy the lilies and he didn't have to share. But he ate so many of the lilies, and sat on so many, that soon, there was only one lily left. When a bee flies by, a bee that Bully had already told to leave, and sees what has happened to the lilies, he knows something must be done. But what? He soon comes up with a plan that will require the help of all the other animals Bully had chased from the pond. Would it work? Bully tackles the ever-present issue of bullying in a non-threatening way that young children will be able to relate to and use. 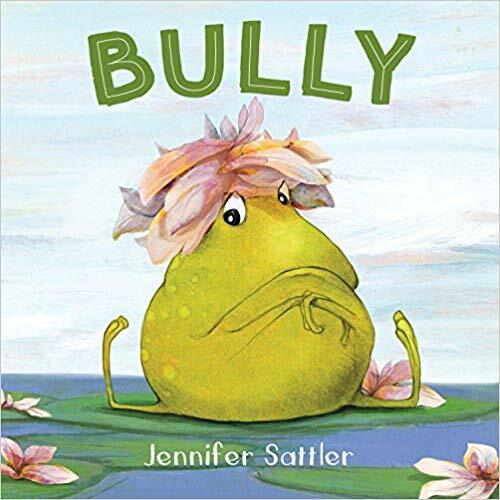 Instead of confronting the Bully one-to-one, the author/illustrator, Jennifer Sattler, instead has her animals work together to confront the bully. This will give children an option of dealing with bullying that they may not have thought about before. On the last page is "A Note about Kindness" with ideas on how to treat others. Add in the sweet, expressive illustrations (love the eyes!) and this becomes an excellent resource to help deal with bullying. Quill says: Bully is a good story to teach both bullies and those who have been victimized by bullies how to work together to end the practice. 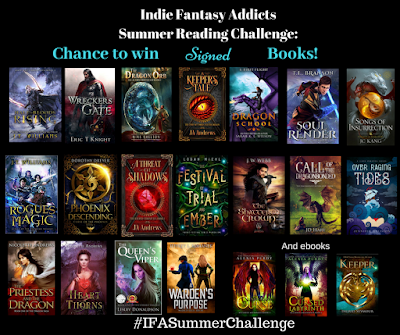 The purpose of this is just to have fun and discover more amazing indie fantasy authors! We are going to make this simple. There is no set reading list. Audiobooks also apply. Read whatever you want as long as it’s indie fantasy. All you have to do is post what you're reading and your thoughts on the book (without spoilers!) so the rest of us can discover more amazing adventures! 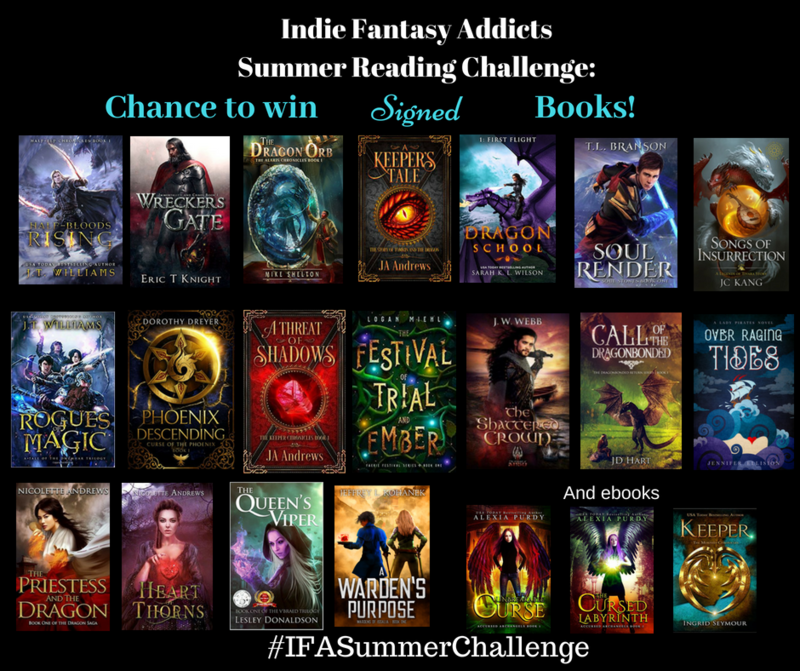 The Challenge will go until September 20, 2018—last day of summer! We will be doing a tiered winning system since not all readers read at the same rate. Eg. A tier for the winner for whoever reads the most indie fantasy books, and a couple tiers for those who read eg. 0-3 and 4-7. Draws will be done to choose winners from the two lower tiers. Tier Three: Chance to win ebooks from some amazing authors.